McDonald's USA announced that Karen Wells, vice president of U.S. Strategy and Menu, will take on an expanded role focusing on U.S. Nutrition. In this newly expanded role as vice president of U.S. Nutrition and Menu Strategy, Wells will be responsible for all aspects of U.S. menu innovation, as well as nutrition strategy for McDonald's 14,000 U.S. restaurants. Wells will continue to report to Jan Fields, president of McDonald's USA. McDonald's recognizes the focus and attention nutrition is getting from customers and other stakeholders, and continues to be engaged in conversations about nutrition with industry and regulatory leaders, suppliers, staff, and franchisees. In her new role, Wells oversees a staff of registered dietitians; culinary, food, and beverage scientists; and other menu experts responsible for shaping McDonald's menu for the more than 26 million customers served every day. As a member of the McDonald's U.S. Leadership Team, Wells is focused on expanding strategic partnerships and alliances across all facets of the McDonald's U.S. business. 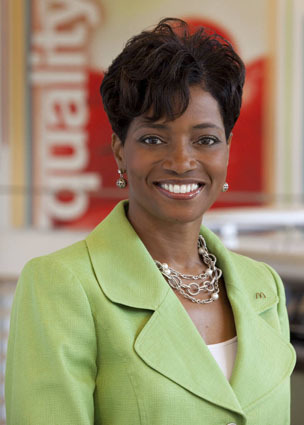 Earlier in her McDonald's career, Wells served as vice president and general manager for the Indianapolis Region where she was responsible for a billion-dollar business comprising more than 600 restaurants across six states. Wells holds a Bachelor of Science and Administration degree in Marketing from Xavier University in Cincinnati, Ohio, and a Master of Business Administration degree from Meredith College in Raleigh, North Carolina. Wells shares her leadership skills with a number of non-profit organizations, including as a member of the Board of Governors for Alexian Brothers Health System, a member of Xavier University President's Advisory Council and Xavier University Women of Excellence, an advisory board member of the JBC Institute Global Power Girls, and a board member of Word of God Christian Academy in Raleigh. More recently, Karen was named as a Rising Star in Fortune magazine. She is a member of the Executive Leadership Council, a non-profit corporation dedicated to providing African-American executives of Fortune 500 companies with a network and leadership forum that adds perspective and direction to the achievement of excellence in business, economic, and public policies for the African-American community. She is also a member of McDonald's Global Women's Network. Wells lives with her husband and two children in Naperville, Illinois.